South Korea is pulling out all the stops for the upcoming inter-Korean summit this week where President Moon Jae-in will meet with Kim Jong Un for the first time — and the food they'll be eating will be fraught with symbolism. Friday's summit follows Kim making an unexpected trip to Beijing and precedes a much-awaited planned summit with President Donald Trump. It will take place in the "truce village" of Panmunjom in the Korean Demilitarized Zone. 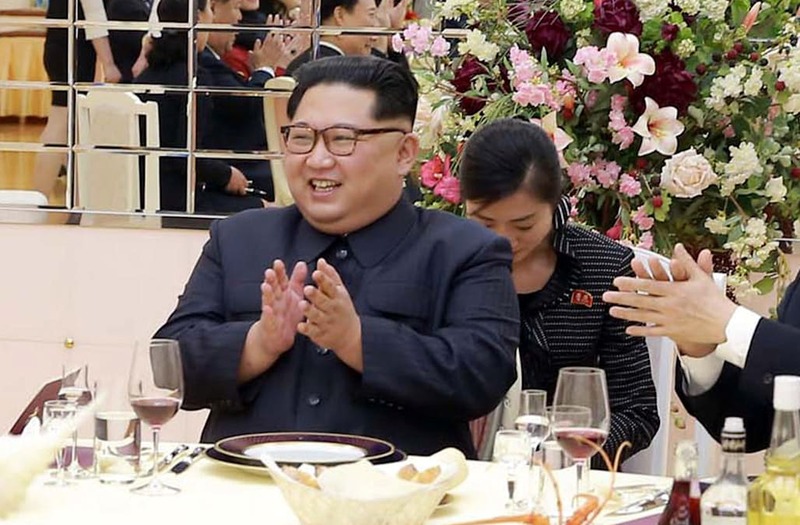 There have only been two such summits since the start of the Korean War in 1950, with both held during the reign of Kim's father, Kim Jong Il. As the summit follows a year of extreme tension between the Koreas, it carries high expectations: South Korean officials are reportedly aiming for a peace treaty between the two countries by the end of the summit. The South Korean President's official residence, also known as the Blue House, released the menu and sample photos of what the two leaders will be eating on Tuesday. The order of the courses is not clear. Chilled octopus from the Namhae Tongyeong sea, in southern South Korea, garnished with citrus soy sauce. Parcels of sea cucumber, cod, and beef — a delicacy of Sinan County, where former South Korean President Kim Dae-jung grew up. Kim Dae-jung called for engagement toward North Korea, and famously hugged Kim Jong Il at the first-ever inter-Korean summit in 2000. Sea bream and steamed crab — a typical combo in Korean food. Rosti — a Swiss dish consisting of fried grated potatoes, which the Blue House said may remind Kim Jong Un of his time in Switzerland, where he reportedly went to high school. This appeared to be the first official acknowledgment of Kim's time there. Grilled John Dory fish — a nod to Moon's upbringing in the South Korean port city of Busan. The Blue House said it picked John Dory because it's considered a high-quality fish in Europe, where Kim grew up. "DMZ Bibimbap" made with wild vegetables, herbs, and rice from Biha village, where former South Korean President Roh Moo-hyun grew up. Roh chaired the second and last inter-Korean summit with Kim Jong Il in 2007. Bibimbap, a traditional South Korean dish, is served as a bowl of rice topped with various food and sauces. Eaters are expected to mix the toppings into the rice themselves. South Korea, which appears to be a fan of culinary diplomacy, also served bibimbap to Ivanka Trump when she visited earlier this year to "symbolise harmony." Beef from the South Korea's indigenous Hanwoo cattle, which is known for its rich texture, high marbling, and slightly sweet taste. Another dish not included in the Blue House's pictures is cold noodles, also known as naengmyeon, which North Korea is sending a chef from Pyongyang to make on the day of the summit with a special noodle-making machine. The chef will install the special machine in Panmunjom and deliver the noodles straight to the banquet when he's done making them, the Blue House said. A mango mousse hidden inside a hard chocolate dome, which the diner can knock apart with a tiny hammer. According to the Blue House, the mango mouse symbolizes warm inter-Korean relations breaking through a hard shell. Tea made with mushrooms from the Baekdudaegan mountain range, which runs from North to South Korea, and orange from South Korea's southernmost Jeju island. The tea is meant to symbolize the hope that the energy of peace will run from Baekdudaegan to Jeju.